Another reason why As hire As, while Bs hire Cs who hire Ds… Also seems correlated to an organization’s headcount, regardless of the divisions of labor. And by the way, doesn’t every developer think that they’re an A? Most of them are wrong of course (although I’m not, obviously :-). Bs are Cs that learned something somewhere on their way. Very interesting, almost explains why I thought I was a *great* developer 2 years ago. But now that I am so much better than back then, I am not so sure if I am actually that good. Another excellent and thought provoking article in the series of Successful Software — thank you Andy. Continuing Sachin’s line of thought, it would be interesting to see how the above data/graphs depend on *age* (of subjects). One could easily argument that people who participate in the last survey aren’t your typical customers, but more engaged ones. Yes, that is possible. But studies show such a skew is common, even when the survey isn’t self selected. Google ‘superiority effect’. Senior management brings in the Bs, middle management the Cs, and HR the rest. I enjoyed reading this and recognize my own development as do a lot of others I guess. Ten years ago I knew I was a good developer, now I know I’m an average developer at best. This insight has made me more humble and thus (I think) I learn more easily from other people and see the good in their ideas and design. It’s a bit funny: you have to realize that you’re on an average skill level in order to be able to learn more effectively. The funniest part is when people claim to be good developers when they have no intention of improving upon themselves. I have seen a few 9-5 workers who consider that on the job experience has made them into excellent software developers when the truth seems far from that. Getting feedback from customers, peers is probably the best way to gauge your level. The next is to accept that you may not be as good as you think and improve upon it. Very interesting and informative article. I like this stuff. For what it’s worth, though, to me your graph doesn’t seem to really support the conclusion you presented. When I look at the graph I don’t see an inverse relationship. I see everyone more or less self-assessing as equally knowledgeable–everyone sees themselves as experts, whether they are in the top or bottom quartile. 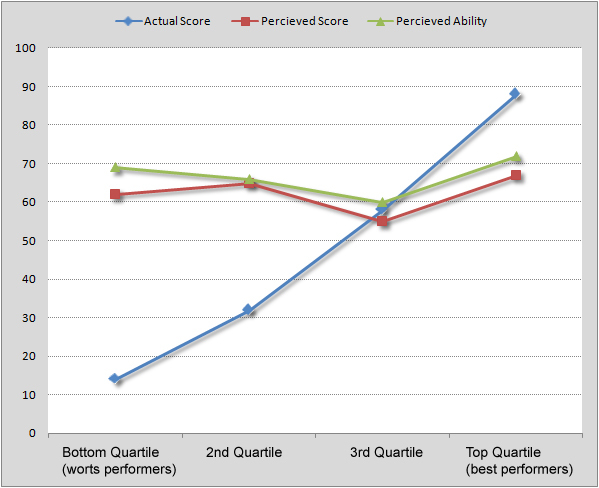 If you look at the green line and blue lines you will that there is an inverse realtionship betweeb actual and perceived ability for the bottom, 2nd and 3rd quartile performers. An interesting branch of this is the intelligence parents have in the eyes of their children. From birth to pre-teen parents start out as knowing everything but gradually deteriorate into becoming morons. During the teen years parents are pretty near retarded and may as well have had a full lobotomy. From about the mid-twenties onwards we are credited with the level of intelligence we actually have. Or at least somewhere in that general vicinity. Reminds me of an old saying: Beware the artisan that claims 20 years experience when he really has 1 year of experience, 20 times. You can learn something new everywhere – just need to be open to it. I have been using a website to sell my products for about ten years. I also have a four degree in art and design. I have wasted thousands of dollars on what I call scammers. and then suddenly think they are designers. They can convince most folks that they are designers because they know technology and the others don’t. Before I hire anyone I want to see all the websites they have designed and go from there. NEVER hire anyone with references or seeing a good volume of work they have created. It occurred to me that those 90% could possibly be right. * give the test to 10 people. Sadly, this is true even if they all score abysmally. I would have given your question about computer skill an intermediate ten years ago and expert about twenty-five years ago. Now I would consider myself a novice, though I have had experience in many languages, OSes, computers, etc. It isn’t just that I’m getting smarter about my ignorance, but there was a time when I had comparatively excellent computer skills on several different makes of computers, etc. But now I’m struggling to stay abreast of a small portion of the wave. I no longer use JCL, Fortran, IBM 370s, etc. Just trying to grab hold of a good Linux distro (and I almost forgot what to call it) to use Python (much less Zope) makes me feel like a pre-novice. So what am I? Novice? Expert? How about ten years from now? What will you be? …and I’m a lousy driver. Summed up very well in this quote. necessary to be able to realize that they have performed poorly. What that means, and what they demonstrate in an experiment in their paper, is that effective teaching/training relies on two parts – the content and the metacognitive role of knowing about knowing. The metacognitive aspect describes that phenomenon we have about getting better at something while simultaneously feeling not as competent about it. Self-reflection reveals while confidence blinds. But when we work with someone, success is best when we teach/train what they are supposed to know along with how they are supposed to know it. Another great article (in case you needed external validation). I find it better (when asessing customer’s IT skills) to ask objective questions: Have you downloaded software before (rather than “can you”). Maybe I should be asking “and were you able to find the file you downloaded?”. Those that worried the most were the best. The WORRYING facilitated the success. (Or to quote Any ____ of Intel: Only the Parnoid Survive. I read somwhere that Steve Jobs does is market research by carrying around a mockup and just asking (the right) people what they think of it. Likewise, I have NEVER trusted my own judgement and luckily have always (for my mISV) had my wife available for a second opionion. And it does matter who you ask. Not all opinions are equally valid.